Apoorva Writes : Apoorva has written a post about Maybelline Fruity Jelly in Mad About Melon. Cute nails : Puja did a mani inspired by the role of women for a private nail art contest and won it. She shares her mani's pics with us. Purple Moments : Smita from Purple Moments posts about her new collective haul. Makeup and beauty !!! 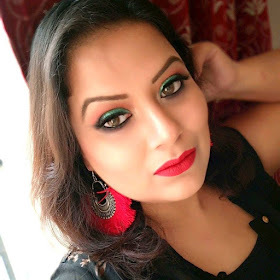 Samannita from makeup and beauty posts about her makeup in a sunny day. Make Up Fashion & Everything I Like : Shourima's EOTD inspired by Independence Day! Our External World : Shilpa from Our External World shares the reason God gave us 5 fingers - to showcase 5 beautiful nail paints all in one post! Impulse : Shamsath reviewing her Secret Crush! Ray- TheBeautySpecialist : Ray shows you an effective way to clean your paddle brush.